In just two years, igloohome has grown from a small start-up to creating presence in over 80 markets. With Enterprise Singapore’s support, the smart lock company was able to gain a strong foothold in Asia Pacific and the US by forging strong partnerships through their participation in international tradeshows. It was a novel business idea that resulted from the founders’ frustration as Airbnb hosts. As landlords, they found it difficult to hand keys over to guests – a similar problem faced by other hosts. So they combined their knowledge in software and algorithm design, and worked with partners to develop a smart lock. 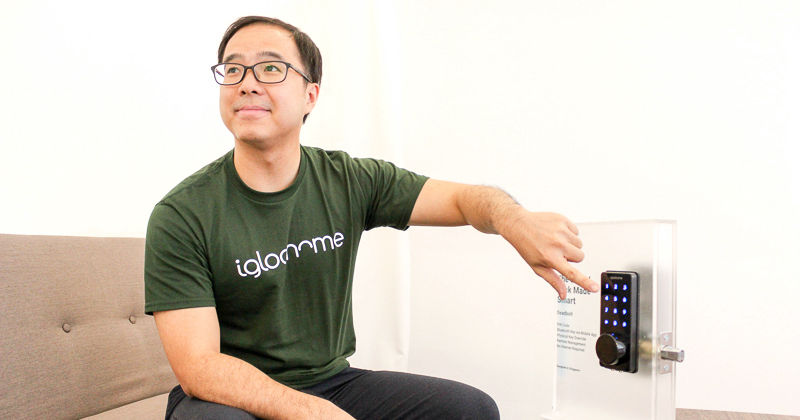 Set up in 2016, igloohome offers a unique smart lock system that allows home owners to grant access to visitors remotely via a mobile app. Homeowners can generate a PIN code for guests, allowing them to enter and leave the unit without a physical key. They can also select the duration for which they wish to give access. Within two years, the innovative local startup has become one of the preferred partner of house-sharing platform Airbnb, and its products are available in over 80 markets. igloohome opened new doors abroad with help from the right partners and programmes. “For a hardware startup, it is important to find the right manufacturing partners to deliver quality at scale, on good credit terms,” said Shermaine Koh, Vice-president of Marketing. It also needed to find the right distributors. The perfect place to seek out such partnerships was at Internationale Funkausstellung Berlin (IFA) 2017, the world's leading trade show for consumer electronics and home appliances in Germany. But the cost of setting up a booth could range in the thousands, a considerable expense for a startup. Fortunately, the company could utilise Enterprise Singapore’s International Marketing Activities Programme (iMAP), which co-funds up to 70 per cent of such expenses, including exhibition rental space and booth construction. The programme helps SMEs to participate in overseas missions and trade fairs, where they can reach global customers, get feedback on products and services and gain a better understanding of the overseas market housing type which affects the usage of their smart lock system. For igloohome, the feedback received at IFA was particularly useful. It helped them tailor their products for specific markets. “We realised that some of our products require minor modifications to suit the regulations of certain countries,” shared Shermaine. For instance, under Japan’s radio law, wireless devices products sold in Japan should have Giteki certification to show that they conform to the country’s technical standards. They also learnt that locks had to be modified to suit doors of different sizes in different countries. Doors in India, for example, are generally thicker than those in Singapore or Malaysia. Depending on the complexity of the changes needed, they took several weeks to even months to modify their locks. But it paid off with more sales. It was timely when igloohome attended Airbnb Open (an annual convention) in the US, as they were expanding their network of customers. This platform connected them to many Airbnb hosts. “The partnership with Airbnb came about because we did a pilot with several Airbnb hosts, and they really liked our product. That convinced Airbnb that our product helped to make hosting easier, and so they announced us as a preferred partner,” said Shermaine. When the time came for the startup to set up a subsidiary in China, it also managed to utilise the Global Company Partnership grant to lower upfront costs. Having a base in China has strengthened the company’s relationships with its partners, and improved the efficiency of its operations. “Many of them have expressed interest to partner us in the China market, which will help build our presence there in the coming months,” she said. 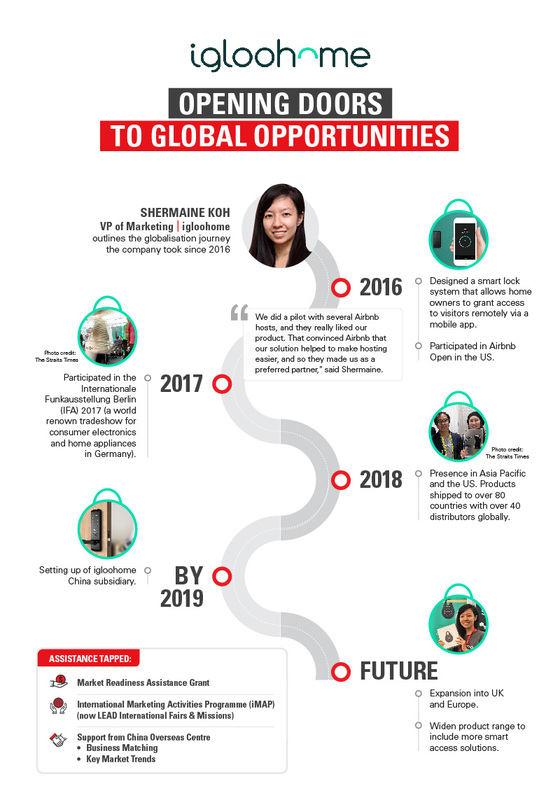 While trade shows were key to igloohome’s successful expansion overseas, Shermaine noted that companies should ask several important questions before deciding to attend one. “Questions we usually ask include who are the other exhibitors, are the attendees relevant to us, how is the event marketed and so on,” she said. She also recommends preparing early for international trade shows. Exhibitors should identify ways where they can get their brand featured before and during the tradeshows, schedule meetings with people they want to connect with at the event and set aside enough resources to manage the operations at the booths. Large ones, like the annual CES in Las Vegas and IFA in Berlin, often have exhibitors making booth bookings a year in advance. “Flights and accommodation get increasingly expensive as it gets nearer to the event date, so it's good to plan early. Conceptualisation and construction of the booth need lead time too,” she added. By attending the most appropriate trade shows and drawing on the right support, igloohome managed to unlock global business opportunities. Inspired by igloohome’s fast expansion in a short span of time? Find out how we can partner you to grow your business today.